On the evening Sara Hagerty addressed the 400 bloggers and writers at Allume Conference in Greenville, SC, I found myself on the hotel bathroom floor. Tears stung my eyes as weakness took over my body. I prayed over and over again because there was nothing else I could do. I was getting increasingly sicker and was caught in a cycle my body couldn’t overcome on its own. Alone in a new city, away from all things familiar. And while I couldn’t see it until later, God had something for me there on that floor. I missed Sara’s message that night, but a week later I curled up on my couch at home to watch the recorded video of her talk. I wasn’t in a conference room, but I found myself in a different kind of meeting. An intimate gathering, just Sara, the Lord, and myself. This time, truth stung my eyes, and I let the tears flow. I am fairly certain that God’s message would have fallen on unprepared soil had I attended Sara’s talk in Greenville feeling like my typical self with my normal complexion and regular appetite. I would have listened earnestly to her talk, nodded in agreement, scribbled down quotes in my notebook, and applauded as she exited the stage. Maybe I would have gotten her signature in my copy of Every Bitter Thing is Sweet. But I’m not sure her words would have found their way in the maze from my head to my heart. 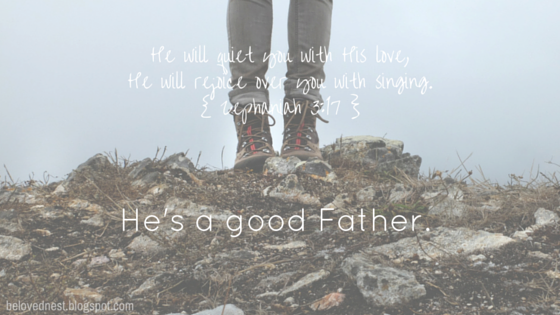 The Lord was busy cultivating in me a new reliance on Him, as Father. The Allume Conference was such a unique experience for me. Prior to that first day, I knew no one there. I hesitantly roomed with two strangers who turned out to be completely delightful and sweet friends. I met and heard from handfuls of women who share my very heartbeat – a love for the Lord and a calling to use our words to further His Word. It was life-giving for me to be in that kind of sacred atmosphere for three days. I drove the three hours home from Greenville reflecting on why God would allow a debilitating illness in the midst of such a monumental weekend. I held on to the fact that I there was a reason, even if I couldn’t see it yet. It took some time for me to feel like I had an answer to my question, but one thing I knew for sure all along: as depleted as my body felt, my soul was full. As a little girl, there was one person I always ran to with cuts, bruises, splinters, and skinned knees. When I fell chin-first (that’s a special kind of skill) on the curb outside the gym at my elementary school, my mom didn’t rush me to the nearest ER to assess the gash on my chin. Nope, we drove straight to Fire Station #3 where my dad was waiting to fix me up. As a firefighter and EMT, he always knew how to take whatever was broken and make it better. Now, twenty-something years later, I can’t help but think: when was the last time I ran to my heavenly Father over my most recent fall? when did I last let Him assess the bruised and broken parts of me? when have I simply rested in his ability to make me whole? So that afternoon at home while my daughter napped and I listened to the recording of Sara’s talk, her powerful words found ready ground. They burrowed deep deep deep into my heart, into places only recently revealed and softened by my reliance on God as my Father. Her message was simple but as personal as it gets: Who does God say I am? What does My Father whisper about me when it’s just us together? I’ve never been bold enough to ask, but with Sara’s urging I find myself inquiring with the trust of a child. Lord, who am I to You? The answer? He’s proud of me. He says I’m special. He says I’m His. He says I’m a good mama. Even when I feel none of those things. He knows me best and yet He loves me best. He says He sees me. His sweet affirmation is the only one I need. I can rest there. He knows me best and yet He loves me best. Unlike the first time Sara’s words hung in the air, I wasn’t sick on a floor crying over my ailment. This time I was on my couch, face full of tears, in awe of his overwhelming love for me despite my brokenness. He looks on us with a Father’s eyes. Kind eyes. Forgiving eyes. The same adoration and immeasurable love I feel toward my own daughter, God feels for me, except His love is perfect in every way. His Father-love is fierce. Unending. God-sized. His adoration never lets up. My motherhood — my daily mothering — is a mirror that reflects small fragments of His Fatherhood back to me so I can know Him better as Father. Whenever I steal a glance at that mirror, I’m reminded — He’s a good Father. One of my favorite verses comes to mind every night as I sing my daughter to sleep in the quiet of her room. “The Lord your God in your midst, the Mighty One, will save; He will rejoice over you with gladness, He will quiet you with His love, He will rejoice over you with singing.” Zephaniah 3:17. That is a picture of a Daddy’s love. 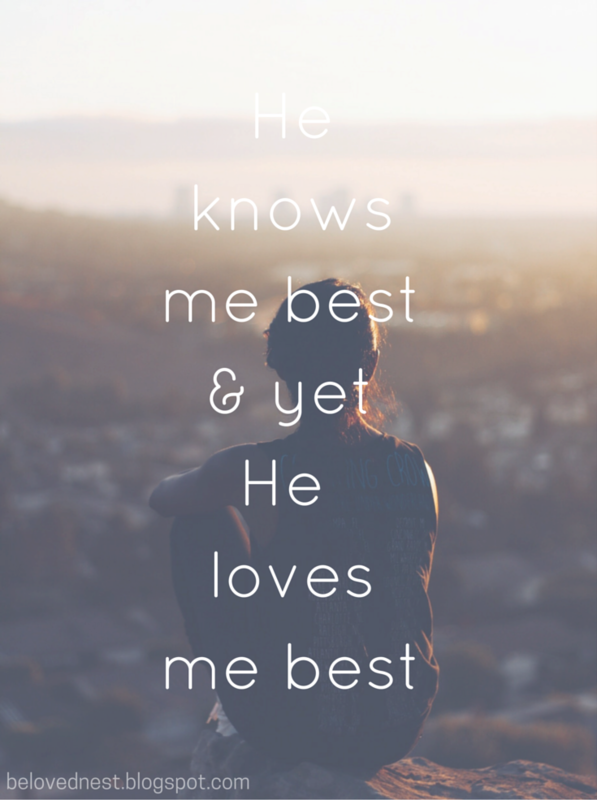 He knows YOU best and yet He loves YOU best. Lord, tell us again who we are to you. When we’re feeling unloved, not enough, unseen, doubtful, broken, or unwanted — tell us again how we’re seen by you. Give us your kind Father eyes to see ourselves, and others, through. Remind us of our place in your heart as beloved daughters. It‘s who You are, it’s who You are, it’s who You are. Before we even say a word.